I bought a set of new aluminum pistons from Langs. The manufactures recommendation is .002-.003 clearance. I afraid to put the engine together that tight. I'm more comfortable with a clearance of .004. Comments are welcome! 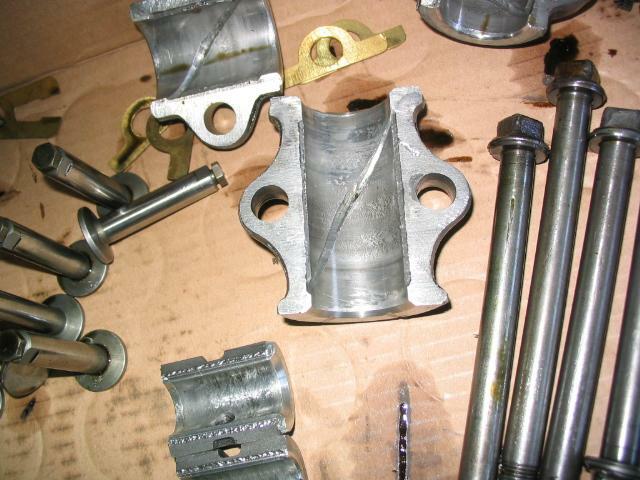 Here are a few past threads found by doing a search for "Aluminum piston clearance". Aluminum expands at the rate of .0000123 inches for every degree Fahrenheit of temperature increase. This is for every inch of length. So for a piston at 3.75" diameter it would expand at a rate of .0000123 X 3.75" or .0000461 inches per degree F.
If the temperature of the piston rises 100 degrees the piston will expand .00461 inches in diameter. I think the piston skirts get a lot hotter than that, probably above 200 and would expand at least .009". So how does a piston that expands .009" work in an engine with .004" clearance? Basically I think it has a lot to do with maintaining a good oil film between the piston and the cylinder wall along with having extra clearance at the sides of the piston skirts to allow it to deform slightly to accommodate the expansion. Adding a small radius to the bottom edge of the pistons and to the bottom of the cylinders can do a lot for insuring a good oil film between the piston and the cylinders. When checking the piston diameters check at the bottom and at the top of the skirt to make sure they are not tapered. I am in the crowd that likes .005 to .007 clearance. Too Loose. The aluminum in the piston is meant to expand to a certain amount that is true but there are other materials in the mix to keep it stable. If the manufacturer says .002-.003 then that's where the machinist will machine the hole to that specific dimension. The block will expand from say 70� to 205� or 135� and that has to be considered in the thinking. I Think both the .002 to .003 and the .005 to .006 clearence camps might be right.. But for different engines and useages. .002/.003 might be right on a OHV engine in ordinary touring use if the piston manufacturer says so, while .005 might be minimum needed in a sidevalve engine in hilly country? The exhaust just besides the cylinder on a flathead engine heats the cylinder unevenly and distorts it. That just might be a complicating factor for piston fit and proper oiling, causing the need for larger play to avoid scoring. Too many recently restored engines has had to be redone.. Besides having enough clearance between piston and cylinder, be sure the piston pins are free to move in their bores in the pistons. Usually they need some honing. I remember, back in the '50s and '60s, they used to put steel struts in the pistons to control expansion. I understand today, with modern technology, they no longer need to do that. But, I have recently rebuilt two engines, and they just don't have the power they should have, and I wonder if the pistons are somewhat seizing in the cylinders? Keep in mind that the bore is expanding too. We have never pulled a motor down for rebuild that were do overs from others, that .003 thousandths and under clearance on a Model T wasn't scored. It always starts from the top of the pistons to the first ring, and then that metal go's down to score the rest of the piston. Kim: I have two engines built by a tool and die machinist. One in 2010 and one in 2012. He is very particular about clearances on the motors he rebuilds. Both of mine were bored out and used 30ths oversize aluminum pistons. The clearance on both was .003 and they have ran great. I think as important as this was the complete balancing and running an additional oil line for better lubrication. The fact that these engines get proper lubrication is as important as most everything else. By the way, one of my motors is a higher performance motor in a speedster and the other is mostly stock in a TT. Don't know if this helps but I also understand leaving a little extra is OK too. Maybe a comprimise at .004 would be the way to go. The problem with scoring is unless it is real bad, you don't know it happened and it will run fine. The bad part is all the ground up Aluminum goes through the rods, mains, cam bearings, transmission bushings, triple gears and bushings, and ball cap and takes its toll! You can squeeze by with .003" piston clearance but if you get on a long hill and get that baby up to boiling and spit some water out the overflow you will risk a scored piston, or two, or more. If you are running at .003" you must not overheat the engine. Then on the other hand if you set them at .004" and really overheat it badly you can still sore the cylinders with melted piston material. It's all a good reason to use the proper oil and leave the heavy stuff for patching the roof of your shop. Aaron, I know a lot of you at your end of the world, select your oil grades because of particular weather conditions, but you need to understand on how a splash feed system works before you condemn the use of a heavy oil! Kerry, what was the source of that description? so, herm, what clearance do you use? I talked with Steve Coniff a while back, and I think he said .0045 is what he is using. Kerry, I am in California. California is not known for sever weather conditions. It has been down to 50F here this week. Cold! I have just stated working on engines with a splash system in 1950 so I have a while to catch up with all you know about it. Now cool some straight 30 oil down to 15F and see how it splashes. It will not. You can NOT splash roofing tar. 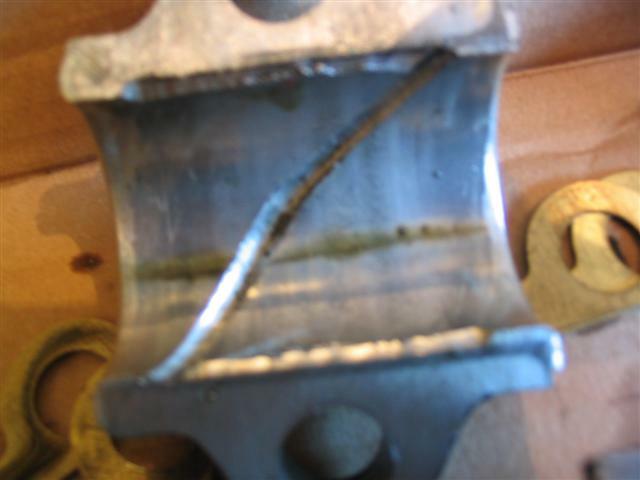 It is not only tight pistons that cause scoring, it is lack of oil too. The guys that have the least trouble are running 5-30 to 10-30 in summer heat as well as cold weather. I have seen people in sub-zero weather pull-start cars with heavy oil in them and heard them start knocking before the oil started to circulate. I have tried to pour SAE10W out of the can when it sat outside at -35F. It won't pour. Tell us all about it. A flooding of light oil is far better than a dab of heavy oil that got there the last time the engine was run and isn't being replaced for a while. Roger K said: "I Think both the .002 to .003 and the .005 to .006 clearence camps might be right..
To add to that, remember that the water jackets on a T engine are only around the top part of the cylinder, not all the way down like modern engines. So the uncooled part of the cylinder will expand more than the top, cooled part. I also run 5W30 synthetic oil and I even change it every couple of years!!! I am with Kerry and Les on this one. We have seen what 2 & 3 thousandths do to pistons fit that way. DO NOT GO BY THE SPEC"S IN THE PISTON BOX!! They are Generic. We use a clearance of not under .004-50 to not over .005, unless the engine is going to pull hard or run high RPM"S all the time. Now the oil, we have in Iowa temp's of 20 below to over a 100. We use straight 30 detergent from 100 down to about 40 to 50, lower then that is 20wt., below zero, even 10, or a 10-20 mix. From the engines we took down, multi- weights are made for oil pumps, not splash. Thin oil when hot is just like Kerry said, NO Cushion, No Cushion, NO bearing surface. I have seen people in sub-zero weather pull-start cars with heavy oil in them and heard them start knocking before the oil started to circulate. I have tried to pour SAE10W out of the can when it sat outside at -35F. It won't pour. Tell us all about it. "END QUOTE"
What has that got to do with anything??? Lets see a show of posts, of who on here who pulls their Model T at -35 below with 10Wt. oil to start it to go for a sunday drive, that is if you can get your other Model T , or your next door neighbors Model T to start! 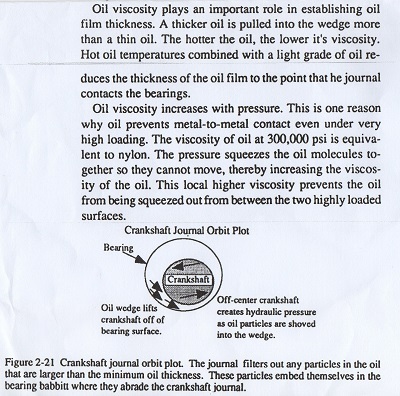 If the oil is so thick it won't pour how is it going to run down the oiler tube? I would agree that 30 can be used down to 50F, but not In December in Connecticut. You cay yourself you use 10 or a 10-20 mix in real cold weather. If you use 10 oil in a T at -35 you will have to tow it to get it started. Strait 10 is too thick, 10W might work okay though, I have started cars at that temp with 10W. Is there such a thing as straight 10 anymore. When I left Minnesota all I saw was 10W-10. At that temp you have to add kerosene, like Ford said to do. I have a 1945 American Machinests' Handbook it discusses aluminum and iron pistons and applies the same clearance for both (in a water cooled engine) .001 inch, per inch of cylinder diameter, top land .005 inch second and third .003 - .004 inch. Ring gap is the same for both .001 - .0015. The standard language is per inch of cylinder diameter. I am not sure in the posts weather per inch of diameter is being addressed or the values are the total clearance? For heavy use the clearances are increased accordingly. Clearance specs are measured by comparing diameters. If the spec calls for 4 thou clearance, that means the cylinder is 4 thou greater diameter than that of the piston. I have been using a clearance of .0035" to .004" with absolutely no issues. I have an engine in the shop here now for some other work that I did in 2007. The owner figures he has somewhere between 14,000 & 16,000 miles on it plus he has a tendency to drive it too fast! (40-45 mph & he says "why not, it sounds fine at that speed"). I looked up my records for fit/clearance/balance on that engine and the pistons were originally fit at .0035" and the cylinders & bores look just fine after well over 10,000 miles of hard driving. I consider .0035 the very lowest clearance limit that won't cause any trouble. I would expect .0025" to .0003" to cause trouble. I would also expect trouble if the wrist pin does not fit properly. Have the piston pin holes line-honed by an automotive machine shop. Even if they "feel" like they fit fine, the bores sometimes are not in perfect alignment and you have to hone out to .001" total clearance before you get the stone to contact 80% of the bore! A piston that is binding on the pin, even slightly, has a tendency to force the skirt against the bore and cause it to gaul. At .001" clearance, (if there is no oil present) the pin will drop right thru the bore. When oiled and assembled to the rod, the rod will move very freely in the piston. ***New pistons need to be line honed to a proper pin fit regardless of whether or not the box or supplier says they are "ready to use right out of the box". *** Sometimes you just dust a few tenths of a thousandth out of the bore with a fine stone to insure the bores are aligned, but sometimes you end up opening the bore almost a thou to straighten it out. Aluminum pistons generally begin to have a noticeable piston slap noise at over .006" piston to cylinder clearance. at a .001 thousandths clearance they are all ready wore out!!!!!!!! Curious point, I have been reading some early auto machine books and it notes that the cylinder is the full size ie 3.750" and the clearance is applied to the piston therefore the piston at standard would be 3.747. 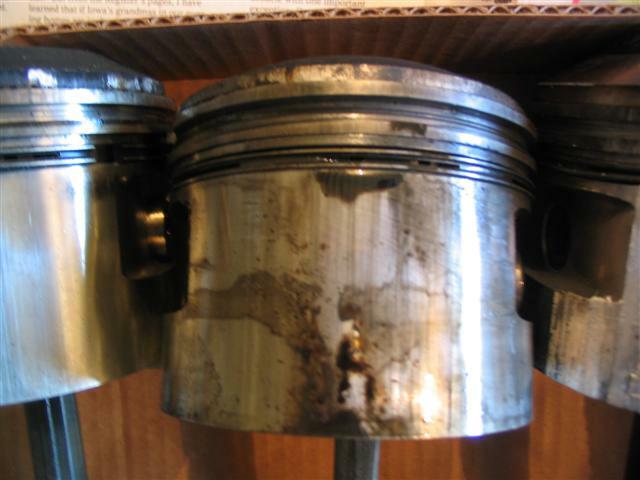 For a .030 OS it would be applied to the standard size of the piston @ 3.747 + .030 = 3.777 therefore the bore should be 3.780. When testing, the piston should fall through and a .003 feeler should be able to be placed on each side of the piston. It is understood that replacement pistons may not be all exact they could vary up to .002 it is imperative that each piston is measured before the cylinders are bored. It may require boring the cylinders at different sizes or re-grinding the pistons. In a perfect world this shouldn't be an issue but there is as many never-had-a-problem claims as horror stories with machine shops and engine rebuilding. Is the clearance applied to the piston or the cylinder? If you can place a .003" feeler gage on each side of the piston at the same time you will have .006" clearance. To add to and verify what you said about "replacement pistons may not be all exact", it might be noted that auto parts stores machine shops (at least the really good shops) even with modern engines, "ALWAYS" want to have the replacement pistons on hand when doing a "re-bore" so that they can individually fit the pistons to each cylinder! my machinest always bores the block to zero clearance and when the pistons come he hone-bores each cylinder to fit its piston. But he usually measures all of the pistons and keeps one and sends the rest home with me because the pistons are all the same....usually! I can't remember the last time there was a set with variation, but I know it does happen. In review of this piston math. Therefore if the bore is .003 larger than the piston you should only be able to slide a .0015 feeler down each side or .003 down one side. What is the actual clearance between the piston and the cylinder wall .003 or .0015? When you measure a piston fit do you slide a .0015 feeler down both sides or .003 down one side? Do you measure the bore and the piston and accept that. I am not trying to be difficult but this issue has always been of interest and there are so many variables. Machine shop practices have changed over the years and so have fitting procedures. Some shops have state-of-the-art equipment and some have 60 - 80 year old equipment. Many young machinists have never seen a Model T and have no idea how they work. A cast iron piston would be foreign to most machinists to day. Aluminum pistons may be better (incomplete comparison) but the car was only designed to go about 30MPH who wants to go any faster? If the bore is .003" larger than the piston does it really make any difference if you slide a .0015" down each side or .003 down one side? Or measure the bore and subtract the piston diameter from it? Especially since there does not seem to be an exact figure we need to stay at since some say .005 and others like .0025. We can't agree on tire pressure so does it matter if you take the tools out from under the seats while you check the tire pressure? Buy'em Books, and Buy'em Books!!!!!!! No it doesn't matter if you slide a.0015" down each side or a .003 down one side it is to clear up the point that the real clearance between the piston and the cylinder is one-and-a-half thou. I do have several books on the subject however some of the specifics are unclear (to me). No Machinist use's two feelers! One hand for your piston to hold the wrist pin in the location that it needs to be. The other hand to hold a Feeler in its right position. Unless you have another very talented extremity with a hand that is very coordinated to run the second feeler in the right places, I think you are out of luck, and is not needed what so ever. The fact is with running two feelers in this case, as well as others, there is way more chance for error. 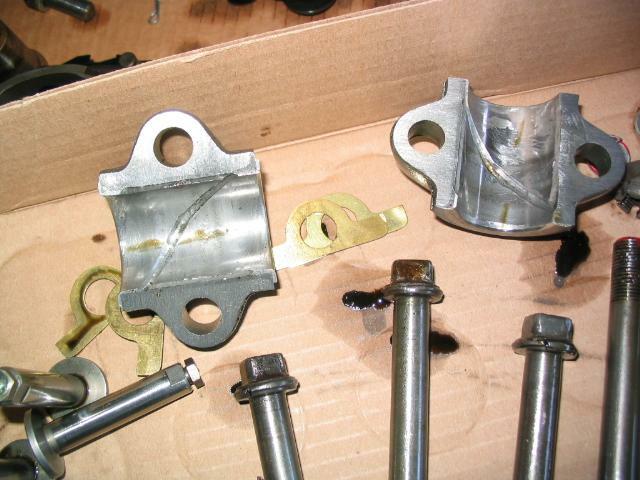 The issue of piston clearance, iron or aluminum is extensively discussed on this forum and has many variables. In reviewing a 1947 American Machinists' Handbook they are somewhat general in their position and use terms like "may be called standard practice". It says "that when using feeler gages the stiffness or its resistance to bending must be considered ie if a .002 feeler will go through the real clearance then is .003. When dealing with such fine tolerances the micrometer or vernier should be confirmed using the test bars. With a test bar in a micrometer with the required friction and held in your hand for a fiew minutes the test bar will fall out indicating that temperature is equally important. says "that when using feeler gages the stiffness or its resistance to bending must be considered ie if a .002 feeler will go through the real clearance then is .003. "END QUOTE"
Who ever wrote your book, evidently didn't know how to use the tools. In the first place, you don't slide a .002, or any size feeler along side of a piston when the piston is in the hole already. The piston is smaller on top, so the feeler goes in with the piston at the same time, as the piston is held up side down with the wrist pin for the handle. That way you aren't guessing it might be a .003 when using a .002. You will know for sure! With a test bar in a micrometer with the required friction and held in your hand for a fiew minutes the test bar will fall out indicating that temperature is equally important. "END QUOTE"
The way it is done to set a Mic. is to check the Mic., and then lay the Mic. and standard down on metal for a minute such metal bench, tool box, vice, ect. to pick up room Temperature, and then recheck.